Thanks to this filter, only the person in front of the screen can see the data displayed. The technology used allows to darken the pictures and text on the screen, avoiding visibility to neighbors. The non-vision angle is 30Â°. 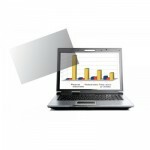 Protects your LCD screen from scratches and fingerprints. Reduces glare for a better sight comfort. Enhances contrasts. Insures clear and not deformed picture. Anti radiation model, blocking up to 99% of the radiations ELF/VLF e-field, antistatic. Anti-glare norm: AOA. 2 fixation modes: with stickers or with slide channels.